We all love our holidays and you can go in lots of directions with this. You might immediately think of the sun, sea and sand or you might go for a winter ski break and don't forget Christmas is just around the corner!! Our sponsor this week is Delicious Doodles and our winner gets to choose 4 digi images of their choice. The DT this week have come up with some great Holiday projects for you and it is worth popping over to our blog here to be inspired. 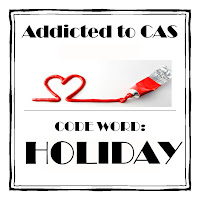 Then it is your turn, just follow our code word and remember only CAS cards for this challenge. Who wouldn't love a bright pink suitcase! This is absolutely adorable...I love the way you stacked the suitcases on top! So clever with the packages on top of the car! Cute, cute card! This is sooooo CAS Sandie, and a very inventive design! The pink suitcase really makes the whole thing "pop". Love it! So cute and fun with the suitcases on the roof! Your layout is great. This is SO cool, Sandie! Love your new dies - the car with luggage on the roof is such a fun way to decorate a holiday themed card - love it! Hi ya Sandie, I nearly used a car for my card this week. This was exactly what I was thinking when I thought of holiday. We must have had the same thought process. Fabulous CAS card. What a great card Sandie.....isn't it strange that half of us have gone "summer" holidays and the other half for Christmas? Think it comes down to the fact we live in the UK and we'd much rather think of sun, sea and sand than cold, wet and dark! lol Love your new dies and that pink suitcase is definitely mine! I LOVE your card! That's how we spent pretty much every holiday- packing up the car and driving to my grandparents'. It's so well framed, too: just the car and the open road.